This article originally appeared on SPIE Newsroom. Just over 100 years ago, physicists discovered that the Earth was being bombarded by ionizing radiation of an unknown nature. These particles, dubbed cosmic rays, are now known to be atomic nuclei, ranging in mass from that of protons to that of iron, and in energy, from a billion electron volts (eV) to 1020eV (50 joules) per particle. Their flux falls rapidly with energy: low-energy cosmic rays pass through our heads once a second, whereas at the highest energies, we expect less than one particle per square kilometer per century. Garden-variety cosmic rays come from the Sun, as part of the solar wind, or from stellar explosions in our galaxy. Very little is known about the highest-energy particles, other than that they are clearly extragalactic, and until recently, were thought to be isotropic in their arrival directions. Particles at these extreme energies interact with atmospheric nuclei at around 10–15km above the ground. The interaction generates a cascade of secondary particles, mainly electrons and photons, which can reach more than a billion particles spread over a kilometer in diameter by the time they hit the ground. Because these showers of particles are very rare, studying them requires detectors with very large collection areas. The University of Utah cosmic ray group pioneered an optical technique for detecting such showers.1 The electrons produced in the showers excite nitrogen molecules, which in turn emit near-UV photons. We collect these photons with fluorescence telescopes that have a large ‘ light bucket’ mirror and a set of photomultiplier tubes at the mirror's focal point to convert this light into an electronic signal. The signal is digitized using flash analog-to-digital convertors. We use dozens of these 5.1m2 mirrors to look in all azimuthal directions. In addition, we have an array of plastic surface scintillator detectors, spread out with 1.2km spacing, to detect the shower particles that hit the ground. With this combination of detectors, we are able to determine the primary cosmic ray energy, some measure of its composition, and the direction from which it came. Our group and others have perfected this technique over the last few decades. 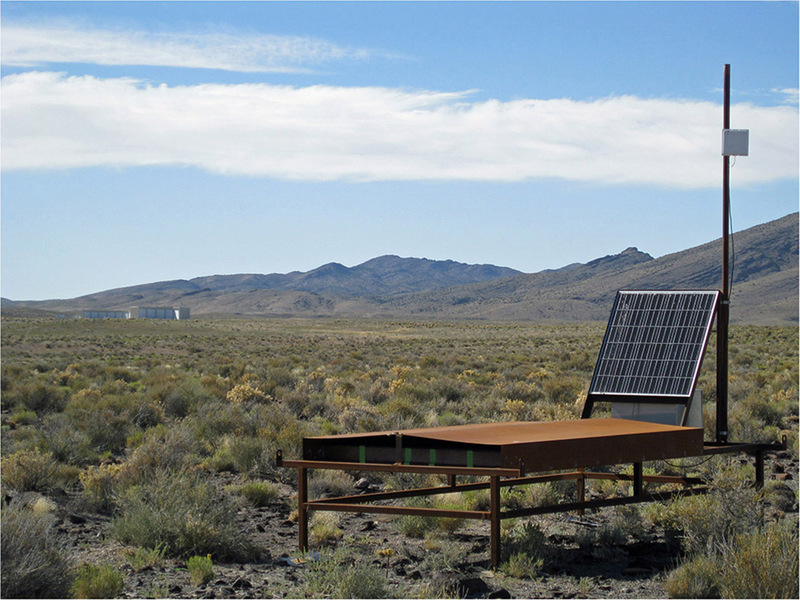 Our current experiment, the Telescope Array (TA) (see Figure 1), is located in the western deserts of Utah. It consists of three air-fluorescence detection stations (see Figure 2) and 507 surface detectors (see Figure 3) spread out over 700km2. The TA is run by a collaboration of scientists from the United States, Japan, Russia, South Korea, and Belgium. 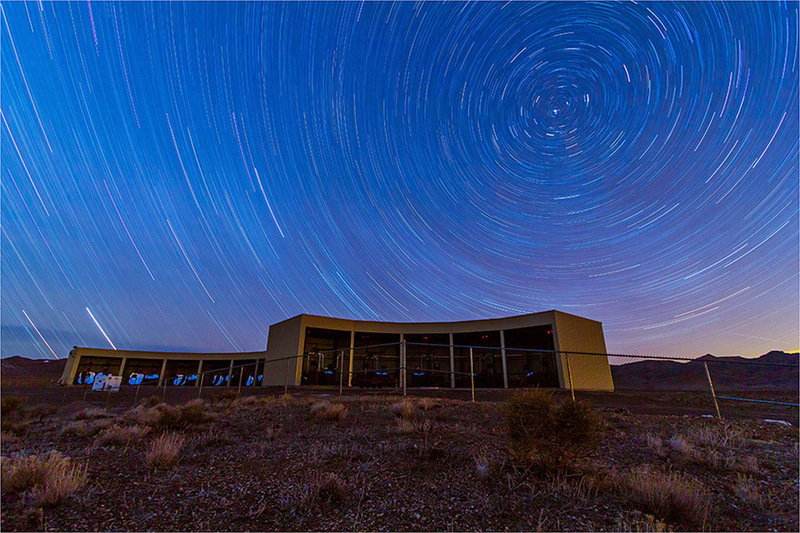 A similar experiment called the Pierre Auger Observatory is located in the southern hemisphere near Malargue, Argentina. It has a collecting area of nearly 3000km2. Figure 1. 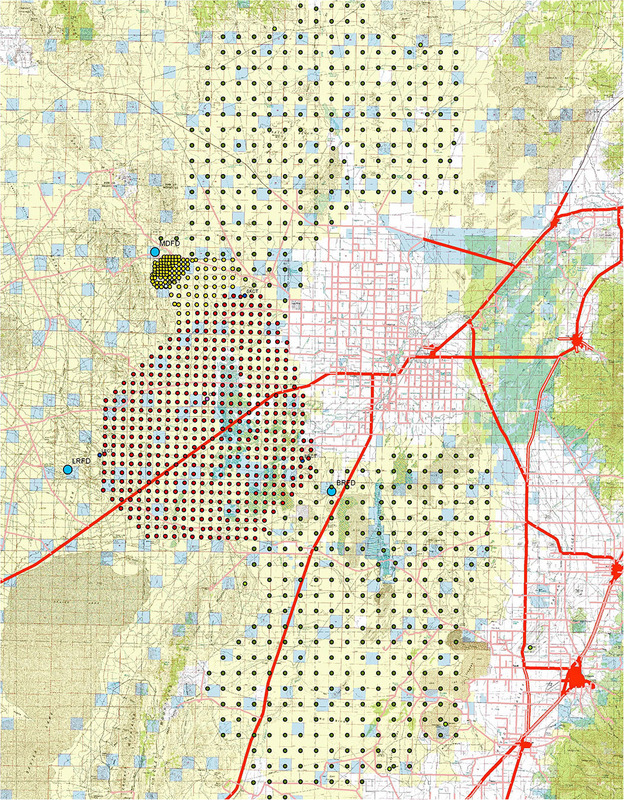 Layout of surface detectors for the existing Telescope Array (red, closely spaced symbols) and the proposed TAx4 array (green, widely spaced symbols) adjacent to the town of Delta, Utah. Blue symbols show locations of fluorescence telescopes. Yellow, closely spaced symbols represent an add-on array that will be used to study low-energy cosmic rays. These are much more frequent than high-energy cosmic rays. Consequently, a small collecting area is sufficient to detect them. Figure 2. One of the three air-fluorescence detector stations at the current Telescope Array. Each station contains 12–14 mirrors that detect near-UV flashes. Figure 3. Surface detector: plastic scintillator with associated data acquisition system and radio data transmitter. One of the most interesting results over the last six years of collecting data with TA is the emergence of an anisotropy in the distribution of the highest-energy cosmic rays in the northern hemisphere.2 This shows itself as a concentration of events arriving from a region of roughly 20° radius near the constellation Ursa Major (see Figure 4). Of the 72 ultra-high-energy cosmic rays detected, 19 come from this region, which represents only 6% of the sky. If the distribution was isotropic, we would have expected only 4.5 events. Although the result is not statistically significant, it is the most solid hint yet of where these particles come from. Surprisingly, it does not appear to be from the sources that astronomers and astrophysicists believed were the most likely candidates: so-called active galactic nuclei, whose massive black holes drive a natural particle accelerator that produces intense radio, x-ray, and gamma-ray radiation. The region of the apparent cosmic-ray hotspot is populated by galaxies that are relatively quiet in these wavelengths. Figure 4. 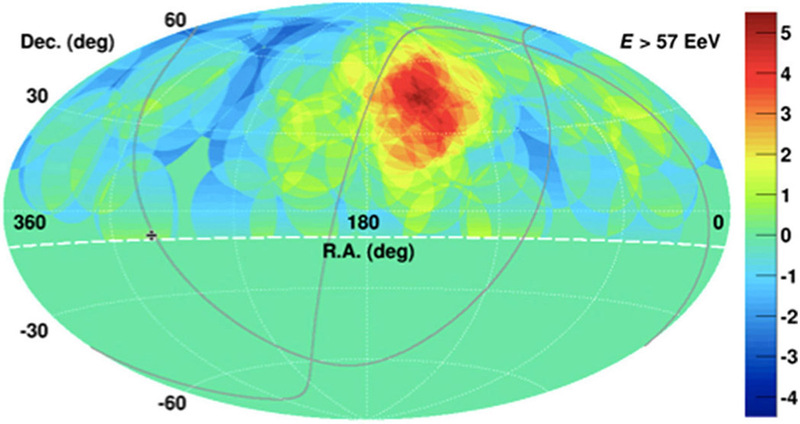 Map of significance of excess events over expected isotropic background for the highest-energy events in galactic coordinates. Events are averaged over a 20°circle. Color scale indicates statistical significance of excess. Taken at face value, the hotspot has a significance of about 5σ. However, when all possible random fluctuations have been accounted for, the significance decreases to 3.4σ. R.A.: Right ascension. Dec.: Declination. E: Energy. 1EeV=1018eV. To further explore this region, we need to enlarge the array to get more data at the highest energies (see Figure 1). Recently, Japan approved funding for a fourfold expansion of the TA, dubbed TAx4. The United States part of the collaboration submitted a proposal to the National Science Foundation requesting funding for additional air-fluorescence telescopes. When this equipment is installed, we will be able to confirm whether the hotspot is real within five years of data collection. In the meantime, we are working with astronomers to determine what astrophysical objects in the vicinity of the hotspot could be producing these extraordinarily energetic particles.